Mānuka Point Station owner Laurie Walker (right), his wife Grace, daughter Shirley (partly obscured at left) and farm worker Ted Porter eat together at the family dining table on their Canterbury station in 1943. The meal is a simple one but the cut-glass sugar bowl in the centre of the table adds a little elegance. 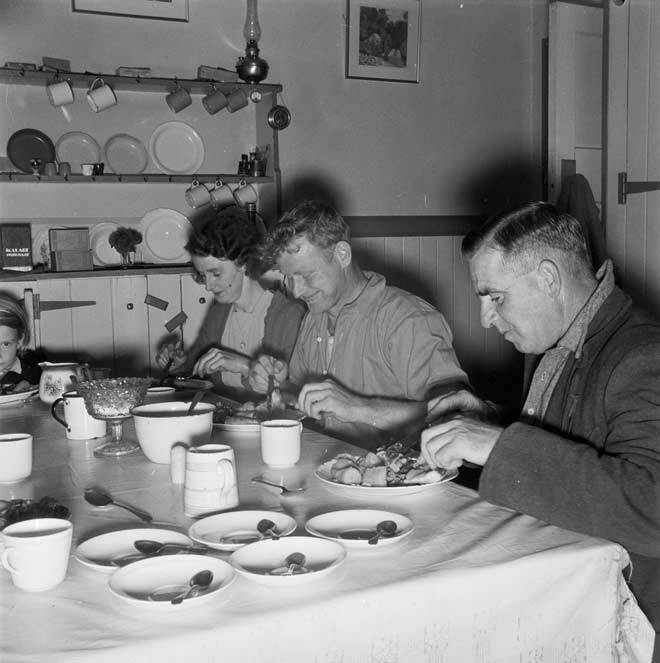 They were probably eating in the middle of the day – in the 1940s many New Zealanders, particularly rural folk, still had their main meal of the day then. Some station owners ate separately from their staff to preserve social distinctions, but the Walkers clearly did not follow this practice.